Back in Michigan, it is time for some rest. There are many photos to go through for a more robust look at the garden bloggers Chicago Spring Fling. I am so glad I decided to attend. Carpe diem. Chicago Spring Fling is filling the camera full and making for a near wordless blogger by the end of the day. The gardens at the Art Institute of Chicago were slipped in after the Lurie Garden and Millennium Park. The Bean or Cloud Gate in Millennium Park had the most amazing pull on the observer. You do not often see sculpture that has such a strong interactive effect with the public. One swan at Chicago Botanic garden. More of these gardens to come. A glimpse of the Lurie garden. 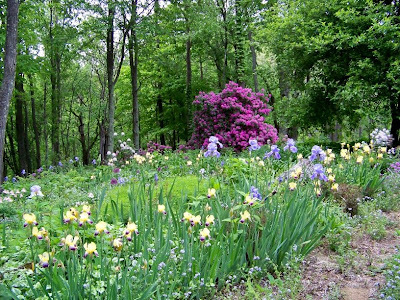 There are a couple of sunny utility meadows that could take clues from this garden. Day two of CSF begins. 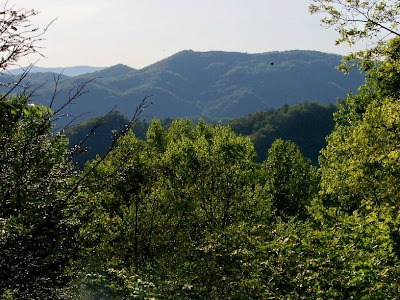 From the wilderness to Chicago through Gary, Indiana (not pretty), this man who has long lived in small towns with expansive views goes through a little culture shock and visual overload. The heart races and it takes a few moments to adjust and calm down. You're in the big city now. Where scenes of the idyllic hang on museum walls. A twinge; I used to live there. Someone's reality is a captured zoo image. Now a stranger in a strange land. Finding a regal exotic new beauty. In so many places I look. Way up north the iris are blooming. Iris was even growing out of spaces in the sidewalk. Clematis climbed hidden back walls. Guarded the entrance to the murals of Diego Rivera. The other side of thinking was exposed. Chicago here I come. Never been there either unless you count a runway. It took a while to quit waffling, but at some point the decision was made to carpe some diem. 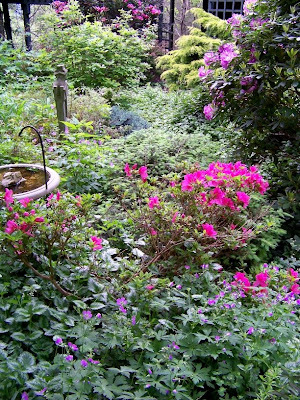 The garden bloggers Chicago Spring Fling is the destination. Bits of Michigan before and after the Chicago bash will be slipped in too. The resident gardeners will be left to handle all the chores while I am gone. I think there is even a plan in the works to try and coax Collar inside the house for some quality bonding time. You gots ta work with what you have. What there is here is plenty shade and dappled light. 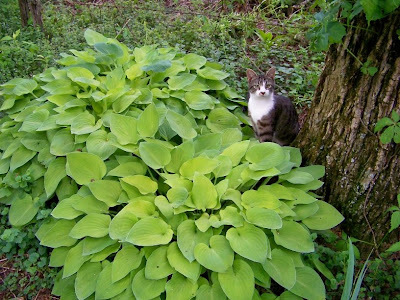 That means hosta will grow here where other things will sulk and wither away. 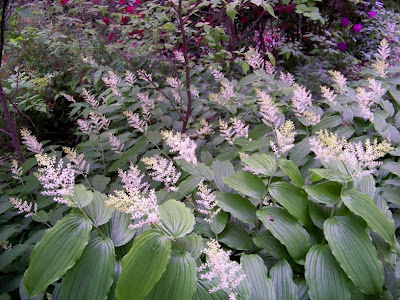 Before we get to the hosta though, there is also a stunning native plant I would highly recommend for a shade garden where it is zone appropriate. 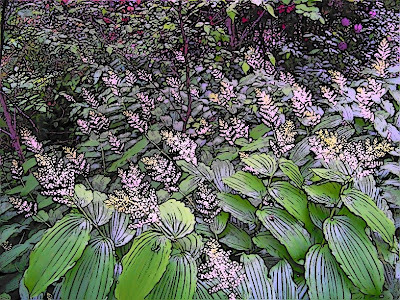 False Solomon's Seal, Maianthemum racemosum, has the graceful form of the Solomon's Seal, but a much more dramatic and showy bloom. This is followed by a long display of bright red berries held above the foliage. It will form dense colonies and seems to keep itself weeded pretty well. 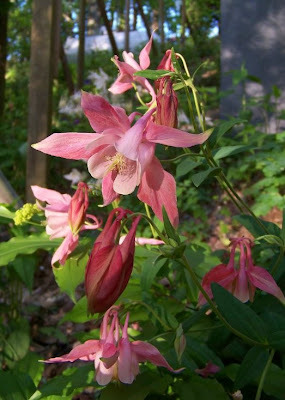 This would be a choice plant for the steep shady slope beneath the scenic highway in my own gardens to be. 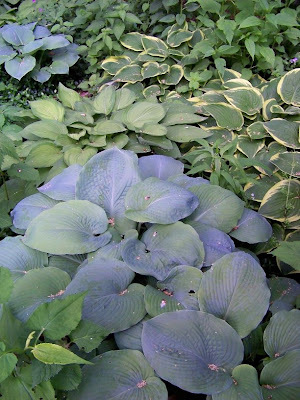 Welcome to Hosta World where there is plenty room to hide under the big rosette of leaves. 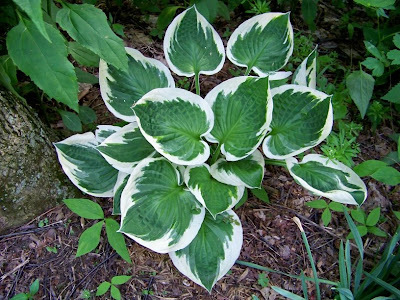 If a hosta has a perceived difference in leaf form, it must be acquired and added to the collection. Here we have a chartreuse center with darker green edging. A crinkled quilted leaf with chartreuse and green streaking. A narrower green leaf with crisp clean white edging. Oops. 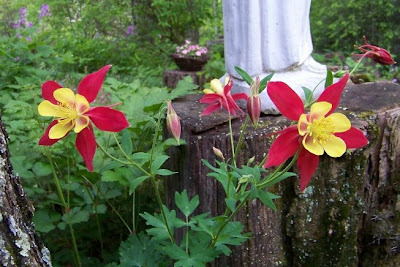 There is that red and yellow McKenna hybrid columbine again. 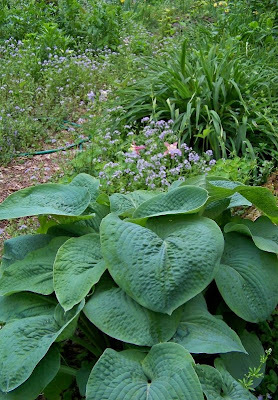 Another nice native plant with large dramatic leaves is the Umbrella Leaf, Diphylleia cymosa. 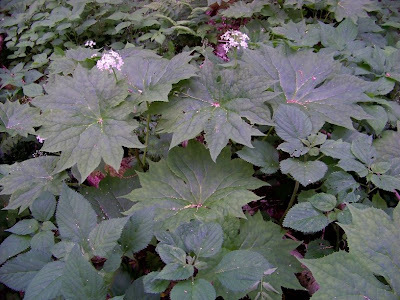 It grows in the deep shade of the forest along the stream banks and in the moist seeps of the mountain side. The flowers are ok, but its more striking feature is a deep blue berry held above the leaf on a bright red stem later in the season. It would be worth experimenting with to see how it would fare moved further away from the wet sites. 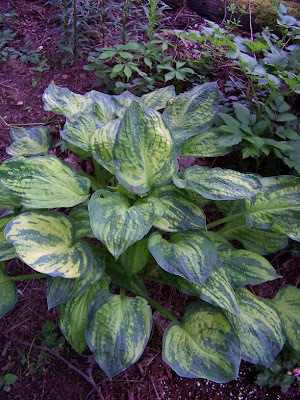 A mammoth solid green hosta. 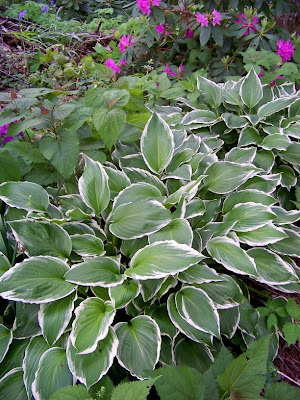 A more rounded leaf with a dark green center and thicker clean white edging. 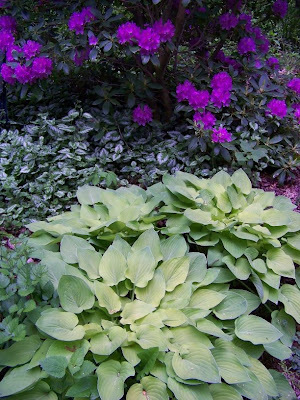 A small leafed solid chartreuse hosta with rhododendron and Lamium maculatum. 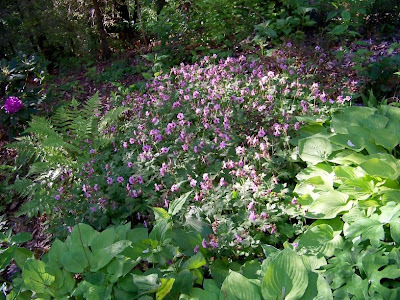 The lamium as a ground cover for shade could be said to be on the aggressive side with a vengeance. 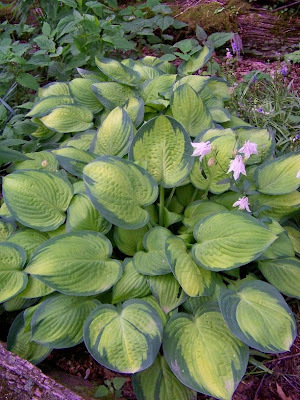 It would take a more precise accounting to show every variety of hosta planted in the ridge top garden. A sampling will have to do. 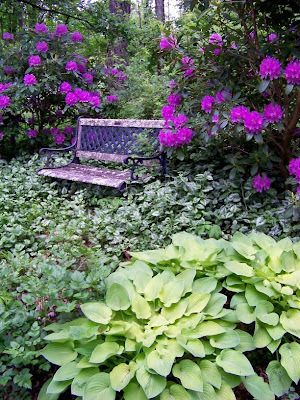 Bulbarella has been busy and a path that lines the new rhododendron garden annex is already lined with hosta divisions, astilbe and dwarf crested iris. 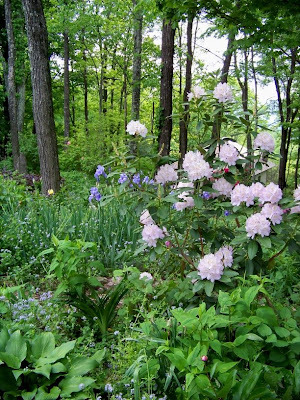 Two dozen new one gallon rhododendrons have been purchased so far this year. 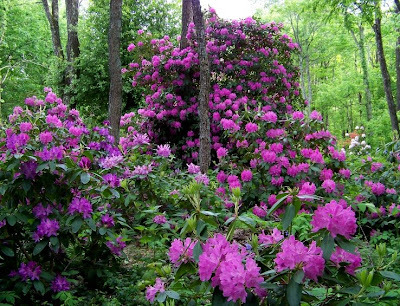 Half of them will be planted in various locations outside of the new rhododendron garden annex. The resident gardeners are 80 years old and they are planting one gallon rhododendrons which are not the fastest growing plants. Think about the faith that requires. 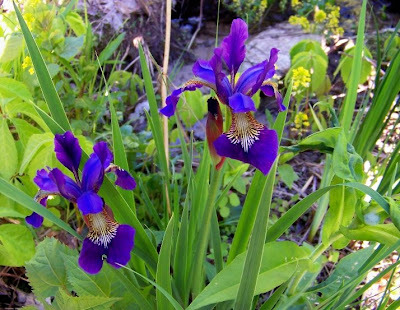 Down in the sunny utility meadow, perched on a rock by the side of the stream, a bold statement is being made by the Siberian Iris 'Caesar's Brother'. This clump is on the list for division. I hope to get to it once the bloom is done. 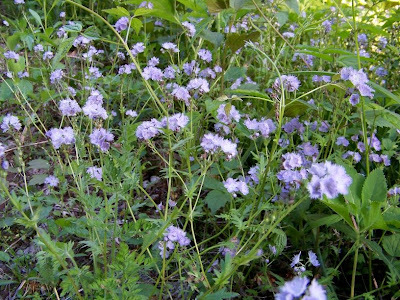 Phacelia purshii makes up in sheer numbers what it may lack in bloom size. On a mountain top covered with dozens of blooming rhododendrons and hundreds of iris, the phacelia has been declared the resident gardeners current favorite plant. 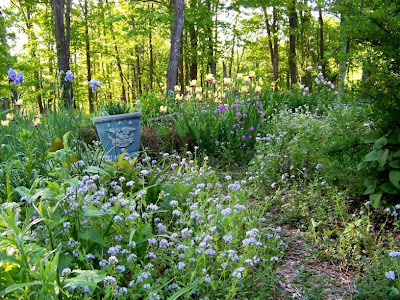 It has spread like a magic carpet of blue that laps at the feet of all the other perennials and shrubs in the garden and lines many of the paths. Why is the phacelia your favorite plant, I asked? Because it was free they replied. They introduced a few plants and the phacelia has done the rest all by itself. 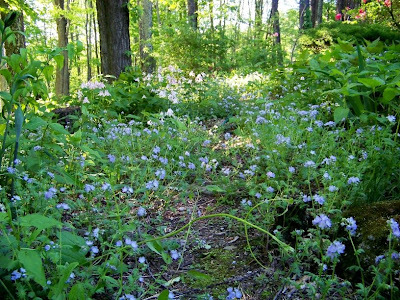 A magic carpet of annual blue wildflowers to delight on the evening stroll. When the hand of the gardener is minimal to non-existent in such a dazzling free display of nature's abundance, how could you not claim favorites for a pretty blue weed? 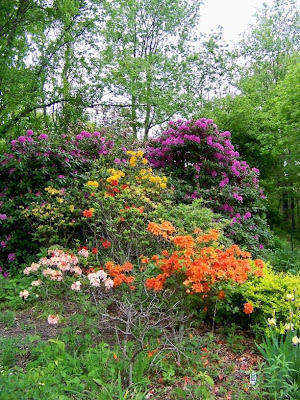 Fueled by the memory induced nausea of a suburban NJ childhood, Michele at Garden Rant laments the pathetic rhododendron that blocks her window somewhere in NY state and considers a drastic root pruning. 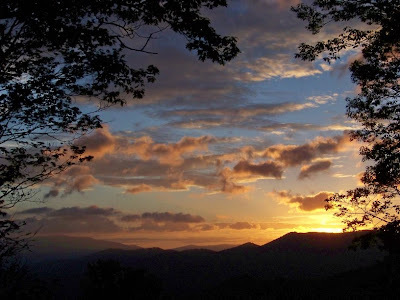 Meanwhile in the high mountain forests of NC, the wisdom of creation is revealed. They come in several shades. And make a fine backdrop for the perennials in the wild cultivated garden. 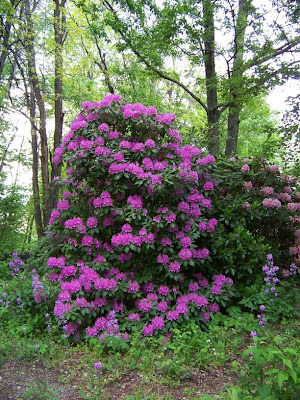 Left alone, the rhododendron will become the majestic creature of its destiny. 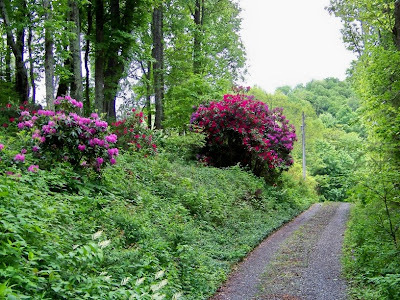 And that is what rhododendrons are supposed to look like in the garden. Prune away Michele. But then, which of these creations is really the most beautiful? We were spared the freezing temperatures by just a few degrees. There was some very minor frost damage in the vegetable garden, probably from the previous day's low of 33.9 degrees, but all is well. In a garden this large coddling is not a viable option. 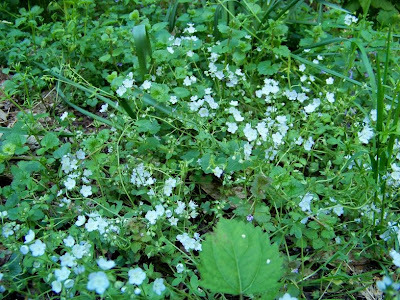 A geranium carpet lights up the shady forest floor, unfazed by the repeated cold mornings. This may be a selected cultivar of the native Geranium maculatum. 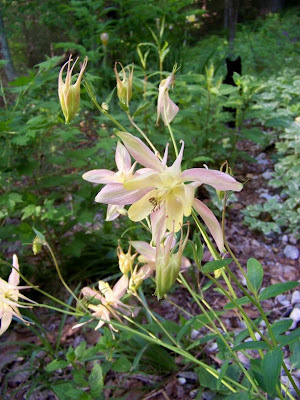 The columbines were all froze last year. This year they are putting on a spectacular showing. 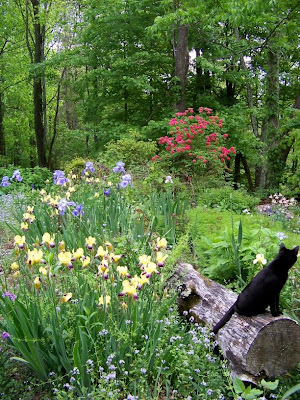 As with most things in the wild cultivated garden, they are spread high and low, from one end to the other and beyond. And of course they come in a multitude of colors, from deep purple blue to the cleanest whites with shades of pink in between. They set seed and self sow freely, moving about on their own accord. Often they are assisted by seed gathering and sowing. New colors are bound to show up from the breeding process. 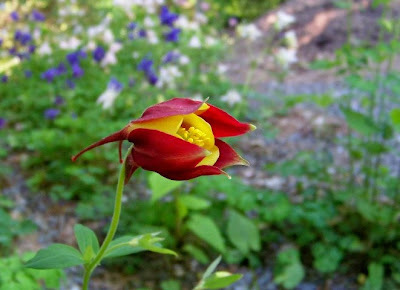 Like this jewel of a columbine, red and yellow together. Cold, cold mornings have quickly turned to warm days. Perfect afternoon skies for more UFO sightings. After tomorrow morning's diagnosed low of 38, the warm should really be here for good. Now I can plant the sweet corn for the raccoon.